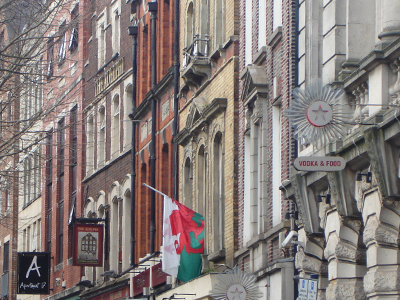 Swansea – the second city of Wales – the Sheffield or the California of Wales? Possibly both. There are similarities with Sheffield. Each has a majestic location. Both grew around metallurgical industries, although Swansea copper declined much earlier than Sheffield steel. 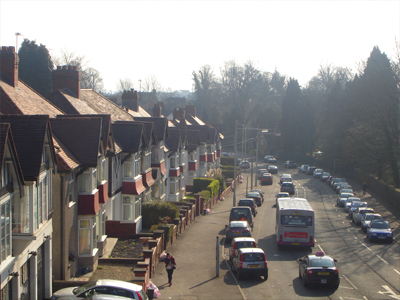 Each is a city of two halves – post industrial to the east but lovely suburbs to the west giving onto glorious countryside. 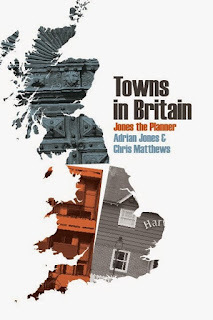 Both city centres were bombed in the war and rebuilt in a style inimical to Simon Jenkins. Both have traces of a more gracious Georgian past. But Sheffield does not have Swansea Bay, rightly compared in its grandeur to the Bay of Naples. And if Sheffield can be proud of the Arctic Monkeys and Richard Hawley, Swansea has Dylan Thomas. I came late to this subversive Swansea roaring boyo with his intoxicating painting by language. If you are not into poetry try his short Swansea ghost story 'The Followers'. Of course young Dylan and Swansea didn't get on; 'this town has more layers than an onion and each one of them will reduce you to tears' was his aphorism, or something like that. Now he is canonised in the Dylan Thomas Centre. Growing up in Cardiff, Swansea actually seemed glamorous. Maybe not the mythical place imagined in the League of Gentlemen – 'will heaven be like Swansea? Yes, only bigger' - but it was on the way to the Gower, which has THE best beaches. The view of the great sweep of Swansea Bay with big mountains behind and the huge scale of heavy industry was exhilarating. Driving into Swansea today there is still this sense of excitement, of scale, activity, drama, big scenery. Swansea is a big port but it is also very much a seaside town. It has a revitalised waterfront and sandy beaches right next to the city centre. The beaches stretch in a gentle arc 10 kilometres to Mumbles Head with a continuous cycle and jogging track at times running through sand dunes and pine groves. On a sunny day this could almost be California. Swansea has something of an end-of-the-line feel about it. By train you approach down the Tawe valley. This had been hideously polluted by the copper industry and the restoration of what had become a lunar landscape has been a quiet achievement of regeneration. High St station was rebuilt in the 1930s and has the remains of GWR elegance, as does the Grand Hotel opposite. However High St leading to the town has very evidently lost that function. It becomes Castle St and at Castle Gardens you will find the impressive remains of the Norman castle with an elegantly arcaded parapet. Castle Square is a big hard landscaped space trying to hold together very disparate elements. Looming behind the Castle ruins is the hulking BT tower, not improved by retro-fitted mirror glass. To the side is the intriguing and elaborate stone façade of what looks like a very early cinema. A grand curved Edwardian block on Castle St, rebuilt after the blitz, adds some dignity as does the dull St Mary's Church diagonally opposite. The rebuilt shopping streets to the west are fairly anonymous but the most amazing thing is the faux half timbered edifice on Caer St, actually built in the 1950s. The thing about Swansea is the close relationship of the city centre to the sea and the docks, quite different from Cardiff. Wind St leads out of Castle Gardens towards the docks, lined with fine pre-1914 buildings for banks and commerce. You could read a lot into the transformation of Wind St from finance to vertical drinking. Virtually every bank is now a pub, some with amusing names like 'The Bank Statement' and 'Idols'. Although Wind St might be hairy on Friday or Saturday night, at least this is a new function for a very important street that had lost its original raison d'etre and become very run down. A dual carriageway separates Swansea from the sea but although this is noisy, inconvenient and ugly it is not terminal. A redesign, slowing the traffic and getting rid of the subways, would hardly be ground breaking but has not happened here yet. 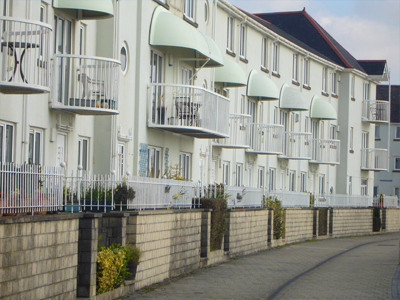 Beyond the subway is a really interesting area – the remnants of Swansea as an elegant Regency seaside resort ('the Brighton of Wales') with gracious terraces showing daring fenestration. 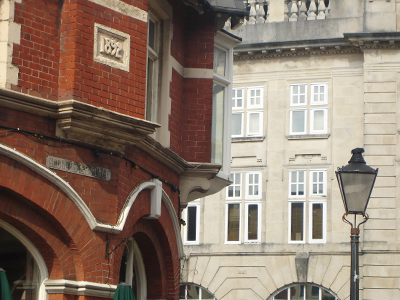 The Assembly Rooms are on Cambrian Place. The old Guildhall on Somerset Place, a Corinthian palazzo of 1848, has been remodelled and extended as the Dylan Thomas Centre. 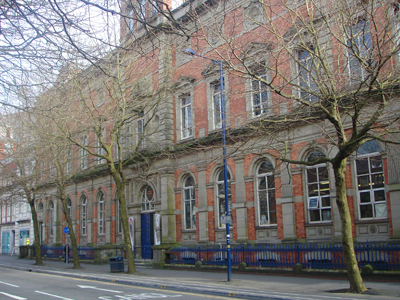 Around Adelaide St are fine commercial buildings associated with docks like the Harbour Trust building of 1902 by Seward (of Cardiff City Hall and presaging its design). Close by is the imposing Greek revival Royal Institution of 1841, now Swansea Museum. The potential square between these fine buildings is spoilt by the thundering dual carriageway and low grade developments beyond. However, behind the Royal Institution is the very pleasing and rewarding Waterfront Museum. This is a marriage of a converted warehouse shed on the South Dock quayside with a 2005 extension by Wilkinson Eyre. The original building of 1901 is simple, in dark red brick with Lombardic gables and a cast iron colonnade. The new building takes the form of 4 blue glass pavilions fanning out from the entrance atrium to embrace a central courtyard between the new and old buildings (strangely inaccessible). Almost Japanese in its delicacy and precision it is ideal for this seaside location. The immediate paving and landscaping cleverly reflects the form of the building. 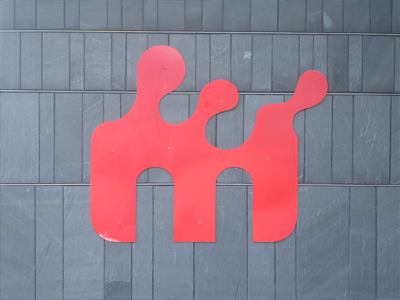 The exhibits on Welsh maritime and industrial history are refugees from the Cardiff Bay museum which was demolished for the Mermaid Quay shopping centre; maybe a reflection on relative values. The Maritime Quarter around the South Dock is certainly a vindication of the City's vision and enterprise. After the dock was closed in 1969 the Council acquired the whole area and initiated one of the earliest and most attractive waterside regeneration schemes in Britain, begun in the early 80s. Although the evocation of brick warehouses is a bit thin and relentless and some of the Po-Mo apartments are very in your face, nevertheless the totality is lively and effective. The best bit is Marine Walk which actually faces the seafront. 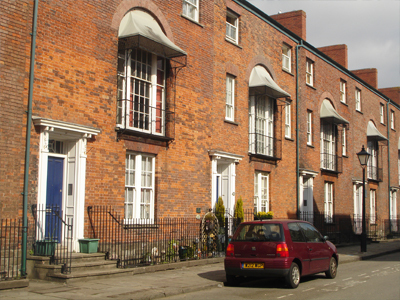 The houses here are really delightful 3 story stuccoed terraces with playful Regency references, interesting and amusing reliefs on many of the buildings and whimsical public art. It is all very reminiscent of Portmerion and streets ahead of any other maritime development in Wales. The latest phases around the dock are bigger scale, sleek and rather cold. Meridian Quay, at 29 stories the tallest building in Wales, has been nominated for the Carbuncle Awards but actually it is much better than any of the many towers in Cardiff Bay, with its curved profile vaguely evoking a lighthouse. When is a roundabout a pleasant square? When the traffic is tamed. The SA1 development at the Prince of Wales Dock on the other side of the River Tawe is Swansea's riposte to Cardiff Bay. However unlike Cardiff Bay it is very well connected by a new sail footbridge which makes it a functioning part of the city centre. An unnecessary but at least modest barrage keeps the Tawe always at high tide, and like the Maritime Quarter this is crammed with boats. The Cork car ferry which docks here towers above the pleasure craft. Few quayside buildings survive but they have been renovated and integrated into the scheme, including a corrugated iron Norwegian seamen's church, companion to the one at Cardiff Bay. None of the new offices or apartment blocks are much to write home about (not easy to tell which are offices and which is housing) but as an ensemble they have coherence. There are even some quite attractive and sheltered public squares which are actually being used. The whole place has much more of a sense of liveliness than the (much bigger) Cardiff version. Back to Castle Gardens and the shopping centre, mostly rebuilt after the blitz. This is not exceptional like Coventry but rather the standard formula. Swansea already had a grid and this was the basis of the new layout with shops along the main streets such as Oxford St and Kingsway. They are low, 3 or 4 stories, horizontal but not uniform; in fact quite friendly and heterogeneous. The interest may be limited to the ephemeral details but some of this is very good, like the Kardomah Café with its beautifully curved brick elevation, mosaic fascia and relief of a coffee worker. Quite a lot of older buildings survived the blitz and were retained in the rebuilding, mostly small scale although there are some magnificent survivals like the baroque Mond Building (1911) and the Carlton Cinema of 1913 (now Waterstones), both by Ruthen. The rebuilt Market Hall is a simple but huge hanger stuffed with stalls and teeming with life. Here you can buy Laverbread, a Swansea speciality made from seaweed and delicious fried with bacon. 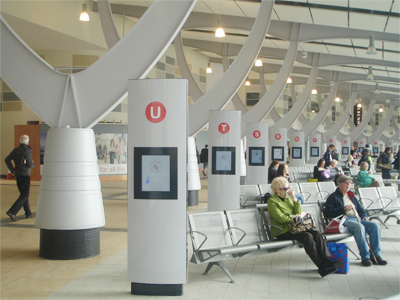 The market leads to the spacious, light and open new bus station. Beyond is the ubiquitous and anonymous Quadrant shopping centre. Between this and the dual carriageway is a mega-crap Tesco with rusting metalwork and a massive open car park - right in the centre of the city. Not good. Stretching westward above the bay are the delightful Victorian suburbs of Uplands and Sketty, with long stucco terraces along and sometimes up the contours. 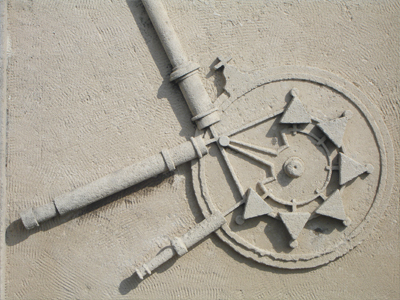 There are also squares, crescents and secluded villas, Georgian and later. Parks, views and excellent local shops all make this very des res. Dylan Thomas was born here near the wonderfully evocatively sounding Cwmdonkin Park. Along the seafront just west of Tesco's are holiday boarding houses like Eastbourne and about as run down. 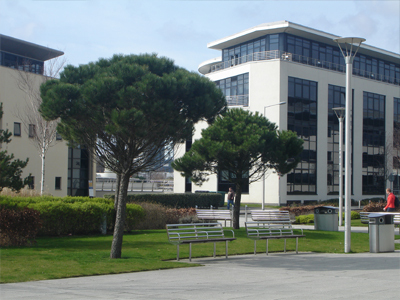 Singleton Park is now home to Swansea University. Singleton Abbey is really a neo-classical villa of 1784. 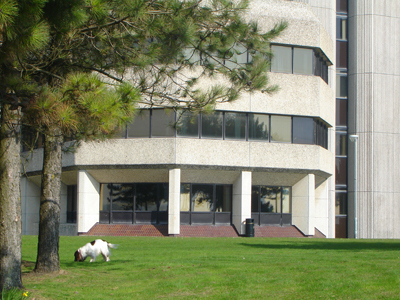 The University buildings are a compact and unremarkable group off Mumbles Road, mostly by Percy Thomas circa 1960. 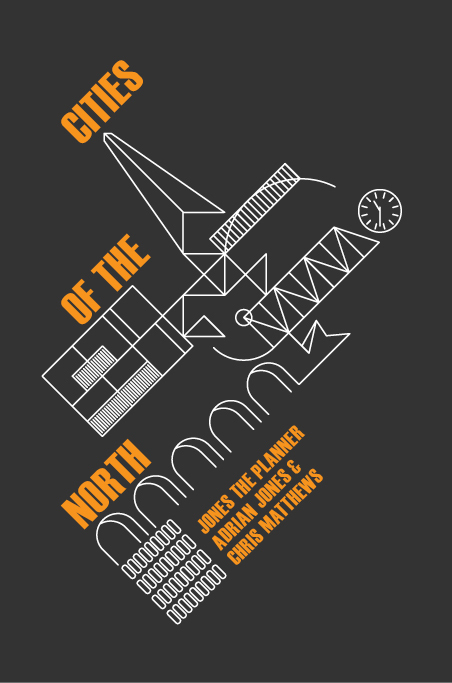 Perhaps the most interesting building is the Taliesin Arts Centre by Peter Moro, much later than Nottingham Playhouse and quite unlike it with an irregular polygon form and oblique angles. 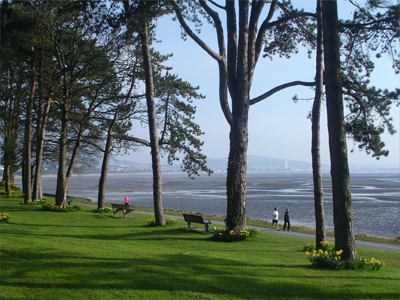 The wooded Clyne Valley separates metropolitan Swansea from Oystermouth and the Mumbles which are quintessentially seaside and fun. Oystermouth has its own castle on a motte dating from the C14th. 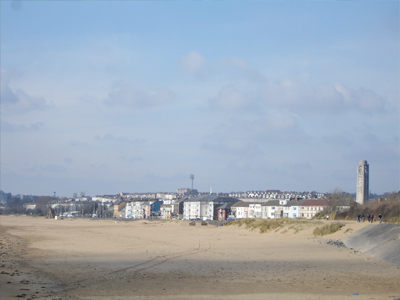 Villas appeared in the late C18th and in the C19th the sea front was developed, culminating with Mumbles Pier of 1898. 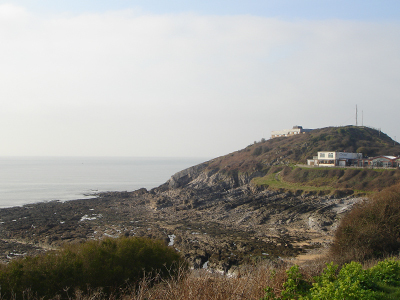 In the post war period there has been much new housing, beginning to impinge on the Gower peninsula proper beyond Mumbles Head. The Gower is a perfect and varied landscape in miniature with breathtaking cliffs and bays – exceptional by any standards and does need strong protection against development. Returning to the city centre along Swansea Bay you may see the great expanse of mud and sand exposed at low tide – a sight too shocking for Cardiff. Flocks of sea birds wheel and feed. If you are lucky you may see migrating ospreys which give their name to the Swansea rugby team. Along the axis of Mumbles Road you will see the magnificent campanile of Swansea Guildhall on St Helens Road, rather off-pitch from the city centre. 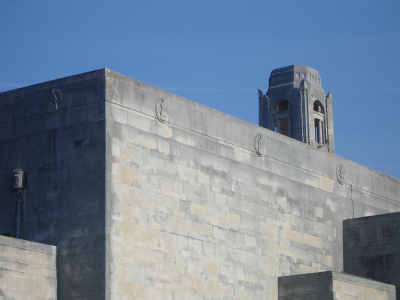 Designed by Percy Thomas (now with the prefix Capita) it was built in an earlier Great Depression partly as an expression of confidence and no doubt in riposte to Cardiff's imperial civic centre. The initial impression is of monolithic white stone blocks of almost totalitarian inspiration; it could be a power station in Metropolis. However this is essentially a classical response to modernism. 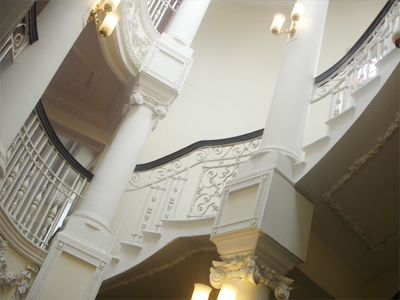 There are 4 blocks around a central courtyard; the council chambers, administrative offices, courts and the Brangwyn concert hall. The towering campanile is very subtle and has interesting details like boats emerging near the top. The building is obviously highly influenced by Scandinavian precedents. What a contrast between the magnificent asceticism of the external composition and the extravagant detail of the interior – Stockholm Town Hall meets the Odeon. Through the cathedral-like entrance the grand staircase with coffered vaulted ceiling leads to the Council Chamber. The Norse origins of Swansea are evoked as Swein, the reputed founder of the town, makes his grim appearance in keystones. The Council Chamber is modelled on an antique temple to Apollo, with almost overwhelmingly sumptuous decoration. 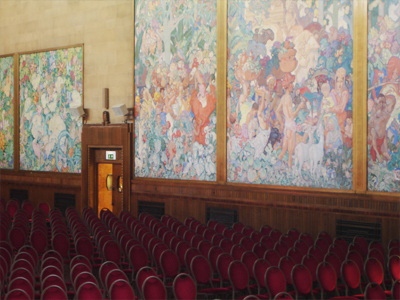 The Brangwyn Hall is notable for Sir Frank Brangwyn's tapestries, originally meant as a war memorial for the House of Lords but rejected as too optimistic. They are almost Gauginesque in the riot of colours showing different races (of the Empire) living in harmony together and with nature – a bit much for their lordships before the war and probably still today. 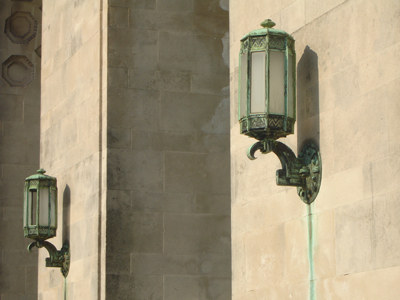 There are prominent art deco lighting fixtures. 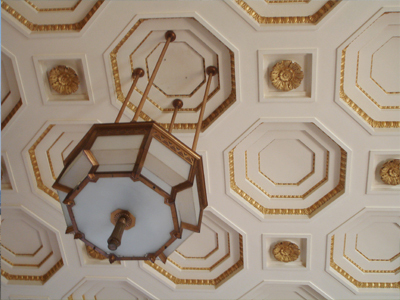 The ante-room has beautiful cream and gold friezes and medallions on dramatic themes including a charming Commedia del'arte group. The Guildhall is a staggering building, too little known or appreciated. Although still in ceremonial use many of its functions have transferred to newer civic buildings which seems very extravagant. Opposite it is the 1985 Crown Courts faced in Portland stone and with a strong central emphasis, really quite good of its kind. County Hall and Library built in the early 80s is just west of the Maritime Quarter next to the beach – few other bureaucrats can enjoy such an enviable position. It is a white concrete aggregate 4 storey complex of angled wings set in sand dunes and pine trees on the seaward side (and car parks on the landward). Apparently highly unpopular with locals it actually looks pretty cool. 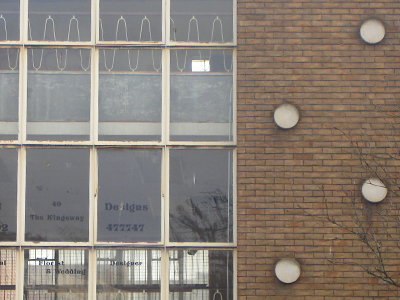 Back across the shopping centre on Alexandra Road are other important buildings. The old Library and College of Art (1886) in red brick and stone has a long Italianate façade. It is now part of Swansea Metropolitan University which provides life for this area and uses for its older buildings. Opposite is the Glynn Vivian Art Gallery of 1909 also red brick and stone. Although not large it is well composed and monumental. There is an exciting 1973 extension of a concrete box above a recessed glazed ground floor, which works well with the Edwardian building. The Gallery contains a fine collection of Swansea porcelain. In the angle to Orchard St is the old Police Station, a confident Baroque building of 1912. Alexandra Road with its grand beaux –arts buildings and plane trees is quite metropolitan, although spoilt by the thundering one way traffic. The newish Police Station tries to jolly up its dullness with a dramatic corner curve of blue glazed brick and a strange art work about police technology. Over 50 years ago Dylan Thomas described Swansea as 'an ugly, lovely town'. Despite all the changes (it was made a City in 1969 when Charles became Prince of Wales) this still holds true today. No-one could accuse Swansea of being a handsome town. It has some fine buildings and salubrious suburbs. The maritime developments are a success, especially compared to Cardiff Bay. But the city centre is disappointing and fraying at the edges. High St desperately needs reviving. The down-at-heel 'Regency' quarter needs careful repair and stitching together with the city core and the maritime areas. The thundering dual carriageway which isolates this area needs to be tamed as does the one way race track along Alexandra Road. 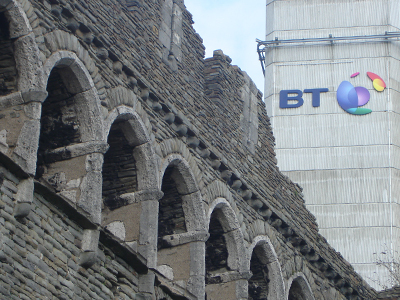 Above all Swansea city centre deserves more than developments like Tesco and the Parc Tawe retail park. But Swansea has two aces to play – its superb natural location and its livliness, friendly Welsh character and palpable presence. 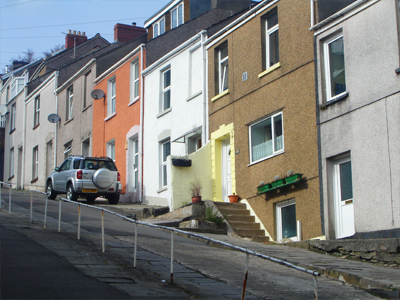 Thanks for this great blog post, it brought back memories of aimless wandering of Swansea's streets in my uni days 10 years ago. An excellent piece (along with the accurate criticisms of Southampton posted elsewhere). A glimmer of hope now in Swansea with a slowly regenerating High St, thanks to input from Volcano Theatre and the Coastal Housing Group. With the sea front cafe and water sports activity centre at St Helen's, the city beach resembled Australia this summer, with beach volleyball until sunset. The gradual development of Kings Dock, with numerous cafes and small bars, many in heritage buildings, extend the city's waterfront over the river. A hugely better result than Cardiff Bay which is so diconnected from the City. Swansea is now a wonderful multi cultural city, with a beautiful location, a treasured Grand Theatre and a sparkling bus station. Just someone please save the old Palace Theatre before the plants take it over completely.